Dominica Nurses Association (DNA) is pleased to announce Family Nurse Practitioner Grethel Peters-Magloire as the 2016 – 2018 Nurse of the Biennium. She was presented with the second Elaine Pringle Award during the association’s 61 st anniversary celebration at the Scotts Head Gospel Mission Church yesterday. This award also means that Mrs Magloire will go on to be the recipient of a Caribbean Nurses Organization Award given to member country’s Nurse of the Biennium at its upcoming 31 st conference in Barbados, this October. Nurse Magloire was nominated among three Registered Nurses by a team of Senior Community Health Nurses. She emerged the awardee as a result of her demonstration of excellence and professionalism in nursing practice and leadership in her professional organization. Mrs Magloire has been a nurse for 30 years. She is a disciplined, self-motivated and committed community nurse whose passion for professional development and nursing service saw her rise from Nursing Assistant to Registered Nurse to Midwife and to her career dream – Family Nurse Practitioner. She holds an Associate and Bachelor Degree in Nursing and a Master Degree in Advanced Nursing, the latter two from the University of the West Indies. 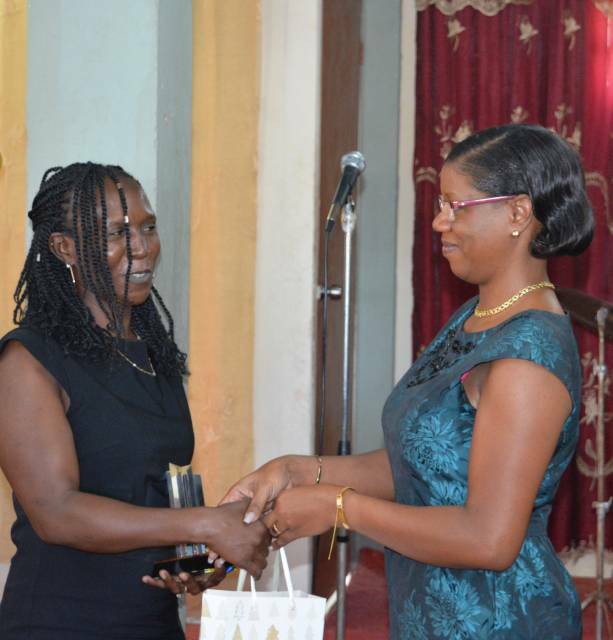 The DNA executive thanks Nurse Magloire for her dedicated and sacrificial nursing service of love and congratulates her on being the recipient of Nurse of the Biennium – Elaine Pringle Award. Nurse Practitioner, Grethel Peter-Maglore hails from the Marigot Health District where she currently serves. The first recipient of the Elaine Pringle Award was Nurse Jessica Cuffy-David. Nurse you rock! After the birth of my baby girl you were one of the first nurses to check her and kept me in check . (Family Nurse Practitioner. We, the CHS Divas ’85 salute you, Nurse Grethel Peters-Magloire. We are very proud of you and your achievements. May God continue to bless you. (Please contact any one from the CHS ’85 alumni). This is my dear neighbour. She truly deserves this award. Her constant dedication to her vocation and career is exemplary. She is superb and will excel wherever she serves. Congratulations #Nurse (As we affectionately call her). We rejoice with and celebrate you. Blessings throughout.